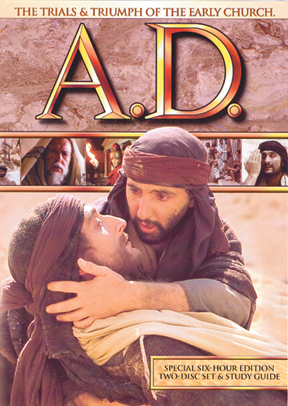 Picking up where the acclaimed Passion of the Christ left off, A.D. vividly recreates the turbulent years following the death of Christ. The earliest experiences of the Christian church after Jesus' ascension are powerfully dramatized in this remarkably authentic TV miniseries epic covering the years A.D. 30-69. The perfect resource for any church or home study group wishing to explore the New Testament period, the Early Church, or the Book of Acts. This Biblically and historically accurate drama comes complete with a 84-page Study Guide providing a 12-week course. The spectacular scope of the project and performances from an all-star cast also make great Bible-based home entertainment.